Weight 175 lbs. 160-180 lbs. Foot Soldiers or Foot Ninjas make up the bulk of the Foot Clan. 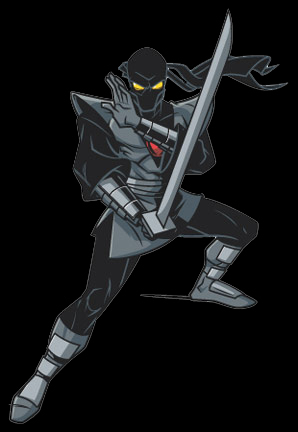 In the Mirage Comics the Foot Soldiers were loyal servants to Oroku Saki, and later Karai. Each Foot Soldier was armed with akatana/spear/kama/nunchaku/fist dagger/knife/submachine gun/etc. and dressed in the same garb: a black, blue, red, grey, or pink Tunic, black, blue, grey, purple, or pink head mask with eye protectors and some armor on the shoulders. Leonardo commentated that their skills were good, but no match for the Turtles. The Foot Soldiers and the Turtles fought several more times until Saki was finally killed. Afterwards, the Foot fell into various splinter groups and were fighting over control of New York until Karai, the leader of the Foot inJapan, came back, killed each one of the 4 Foot Elites and regained control of the Foot. In Volume 4, the Foot gained a security contract with the Utroms, who were visiting Earth on a peaceful diplomatic course. Although Karai had no problems with the Turtles and some, if not, most of the Foot apathetic to the matter, one Foot Soldier named Cha Ocho, had a strong dislike for the Turtles. The Foot were also attacked by mysterious warriors at this time, in which Leonardo was helping the Foot. They also developed an interest in the occult and distributing books of dark arts. The Shredder utilized robot ninjas known as “Foot Soldiers” when he began his crime spree in New York City. However, they are not very effective in combat, as they fall apart easily (Turtle Tracks). The Turtles fought them in all five episodes of the first season however as the 1987s series go on they are seen less and less because Shredder usually has to do things himself with Bebop andRocksteady. However in Turtles Forever there are hundreds to thousands of them fighting the 2003 Turtles and the 1988s Turtles underground after leaving the Technodrome with Bebop and Rocksteady leading them into battle. This version of the Foot do not talk at all nor do they use ninja weapons but they use guns. A few episodes show them using swords and other weapons as well, especially during the first two episodes of the first season. In Turtles Forever they had a self destruct sequence that distracted the Turtles while the 1988s Shredder escaped with the Technodrome and almost left Bebop and Rocksteady behind. The 2003 Leonardo is shocked to see that the 1988s Foot Soldiers are robots since the 2003 Foot Ninjas are humans. The 2003 Michelangelo says the 1988s Foot Soldiers are exploding robots. The 2003 Raphael takes pleasure in destroying all of the 1988s Foot Soldiers without his brothers help and was having fun doing it until the 1988s Donatello threw a large boulder down and crushed several of the Foot Soldiers and said strike making the 2003 Raphael angry. In the cartoon, The Shredder once considered making more intelligent Foot Soldiers, capable of learning and taking decisions by themselves. One Foot Soldier named Alpha One was the only Foot Soldier who could talk and was seen in Season Four, in the episode was called The Foot Soldiers are Revolting. However, the idea was quickly abandoned when he rebelled against The Shredder. The Foot robot concept allowed the Turtles to destroy the Foot soldiers without any moral thoughts, allowing Leonardo and Raphael to use their weapons more offensively. Meanwhile the series could keep its younger audience and remain a “family show”. This principle also benefited the video games. The Archie Comics TMNT Adventures comics features more advanced Foot Soldiers in addition to the basic model. In the comics, The Shredder also built a giant Foot Soldier, who fought against the Warrior Dragon in New York City. The robot was destroyed when it crashed into the Statue of Liberty. The Shredder recruited many kids, mostly teens, from the streets and trained in the art of Ninjitsu. The kids made crime sprees in the city, financing their growing crime empire. (Teenage Mutant Ninja Turtles) After the Shredder was supposedly killed in the first film, the Foot Ninja were severely beaten into a small group by the ninja turtles. This version of the Foot are dressed in black outfits, have red bandanas on their heads and bug eyes. They usually fight with swords, bo staffs, axes, and other weapons but will fight the Turtles with their bare hands if they have too. They are lead into battle by Tatsu in the first and second movie while Shredder stayed behind. The Foot were victorious in their first battle with the Turtles but in the second battle they went down pretty easily. Foot Ninjas are good in battle but most of the time they’re clumsy and the Turtles appear to be having fun with them in battle. Michaelangelo was taking them down while talking to Donatello and doing his Wheel of Fortune on them at April’s shop. When the Turtles first battle the Foot Michaelangelo says “I thought insurance sales men were pushy”. The original foot soldier figure was one of the harder to find out of the original releases. Very largely resembling the cartoon counterpart, its figure also largely resembled a primate with long arms and squat posture. Accessories included a clamp-spear, and a weapon resembling a modern morning star. Based off the Foot from the movie. Speedeez Foot Ninja Set: Includes the Battle Shell, Foot Soldier on Razor Jet, Leo on Shell Cycle and Foot Helicopter. Unlike the 1987 cartoon series on which they were based, the TMNT videogames introduced Foot Soldiers with uniforms of several different colours. These colours represent the type of weapons they are carrying. Teenage Mutant Ninja Turtles: The Manhattan Missions uses Foot Soldiers from the Mirage Comics though they dress in black like the films. Video games, based on the 2003 animated series, have Foot Soldiers which appear as they do in the 2003 series including a playable appearance in TMNT: Mutant Melee, where they are voiced by Jason Anthony Griffith. Video games based off the 2007 film have Foot Soldiers from the film. The fighting game Teenage Mutant Ninja Turtles Smash-Up, allows you to play as a Foot Ninja, looking similar to the ones from the 2007 movie. Teenage Mutant Ninja Turtles: Arcade Attack brings back the concept of multi-colored Foot Ninja with different weapons, with standard, blue, and red (2003) and standard, gold, blue, and red (Cyber).